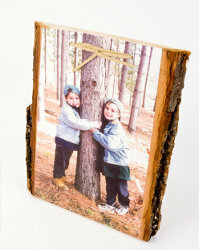 Make a memorable decoupage frame for Grandpa that reminds him of nice weekends on the lake or camping with the grandkids. This rustic decoupage cabin plaque from Plaid brings nature right into the living room and makes a great Father's Day gift. CS11301 - Mod Podge ® Matte, 8 oz. Color copy the image/photo and enlarge or shrink as needed to fit the plaque. Trim the image to the fit the plaque. Using a foam paintbrush, apply an even coat of mod podge to the top of the plaque. Coat the front and backside of the paper image with mod podge. Place the image onto the plaque, use your fingers to press out any air bubbles. Smooth your brushstrokes. Allow to dry. To make a hanger, Drill 2 holes near the top of the plaque, lace the holes with leather.